Using modern technology, a Virginia museum is working to unwrap the story behind one of the earliest surviving Egyptian mummies. 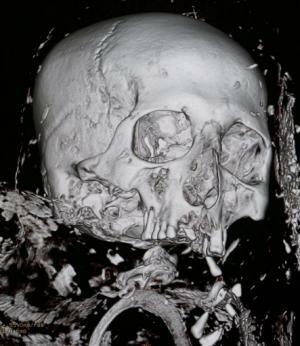 The Virginia Museum of Fine Arts in Richmond partnered this week with a medical imaging center to complete a CT scan on Tjeby, its 4,000-year-old mummy, in hopes of piecing together more information about the mummy itself and better understanding the early history of the mummification process. While it isn't the first time a mummy has gone under the digital knife, only a handful from the time period have been examined in this fashion. The information gathered will help provide greater detail of the body, create a 3-D digital model and even reconstruct the face of the mummy that has been on display off and on since being acquired by the museum in 1953. Little is known about Tjeby, who was buried in a rock-cut tomb at a site known as Sheikh Farag in upper Egypt and excavated in 1923. What museum officials do know is that he dates to between 2150 and 2030 BCE, a time of instability in Egypt, with the breakdown of central authority and economic decline. Previous research suggests Tjeby was 25 to 40 years old when he died. Experts hope a closer look at data will help piece together more biographical information, such as Tjeby's specific age, diet and cause of death. They also will look at the materials used to mummify the body and the amount of soft tissue that has survived, and will determine whether organs have been removed, as they were in mummies from later periods. Researchers say the technology allows them to learn about the mummy in remarkable detail without invasive or damaging procedures. "It's easier to unlock that door of mystery to discover the secrets of the past," said Alex Nyerges, the museum's director. He anticipates incorporating information gleaned from the scan into the display of the mummy, which also includes its coffin and other artifacts from inside, such as a model of a boat and a granite statue. 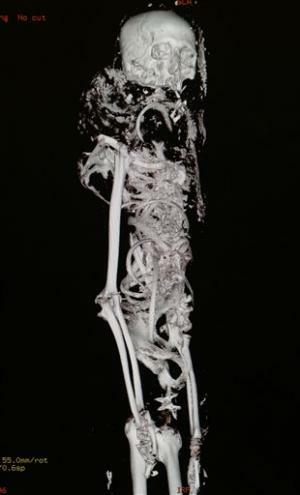 The first mummy CT scan took place in 1977. But back then—and even when Tjeby had his first imaging scan in 1986—the technology was fairly primitive, and little could be seen, said Jonathan Elias, director of the Akhmim Mummy Studies Consortium, a Pennsylvania-based organization that has collected imaging data on about 30 mummies and offered to help the Virginia museum analyze its information. "We're really at the beginning of the process, even with modern technology, to unravel what's gone on in this culture," Elias said. "Compared with 1986, 2013 is just like going to another planet in terms of what we're now able to do." On Friday, museum employees removed the mummy, wrapped in preservation material, from his coffin and used Velcro ties to secure him to a platform, readying him for the 15-minute van ride from the museum to suburban Richmond for the scan. One employee rode in the back with Tjeby as the van drove slowly, trying to avoid sudden bumps or movements. When he arrived at HCA's Independence Park Imaging Center, Tjeby was carefully rolled in on a gurney, placed on a sliding table head-first and uncovered, revealing aged, brown-tinted cloth wrapping. A group of technicians, doctors and museum employees began snapping photos to personally document the occasion. 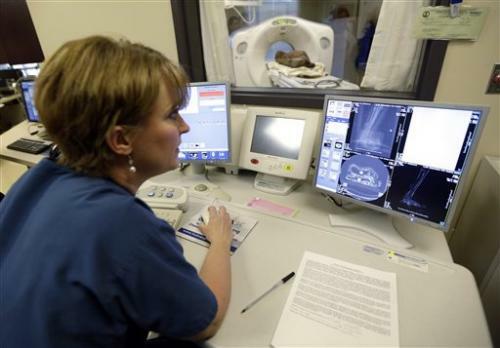 Then, with the click of a button, an automated voice urged the patient to lie still and not breathe for the CT scan. "He's the ideal patient," joked Peter Schertz, curator of ancient art at the museum. "If he only stopped fidgeting." Within seconds, thousands of images began to flash on the computer monitors. "He's like a jigsaw puzzle," said Dr. Jim Snyder, a diagnostic radiologist who assisted the museum with the scan. Immediately apparent to the group was that some of Tjeby's bones had fallen or moved into the mummy's chest cavity at some point in his history—likely after he had been mummified. 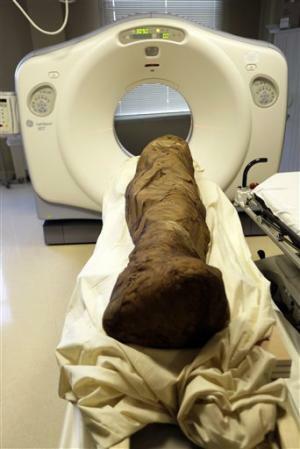 Doctors and the museum staff noted that the main portion of his body was wrapped separately from the limbs and other parts of the body were a bit "jumbled." A more in-depth examination of the images will take some time, but Snyder was able to do a quick 3-D rendering, giving Tjeby his first close-up in more than 4,000 years. Museum officials did not provide a timeline on the rest of the process, but were excited about the prospects. "It's amazing that we are able to do this," Schertz said. "This is history."